Unity joins with thousands of other faith-based organizations, businesses, nonprofits and government agencies to contain Malaria by 2015. Partnering with 11 Lutheran churches in Africa, the structures are already in place to reach individuals and communities, by providing lifesaving medication and health care, educating people about the disease and its symptoms, and preventing the spread of malaria by distributing mosquito nets and supporting water treatment projects to control the environments where mosquitoes breed. 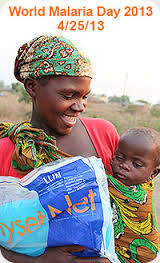 The goal of the ELCA Malaria Campaign is to raise $15 million by 2015. Here at Unity our goal is $450 by April 28, the ELCA celebration of World Malaria Day. Led by our Sunday School kids, Eugene Leonard, and Alisa Thun, you can help by accepting a Mesquito Pledge card and placing it in the Mesquito Netting collection in the Prayer Area, read the weekly Malaria Campaign info, and multiply your giving by using a 2nd pledge card to invite a friend or family member to join in! Click here to make a donation today.